Dutch painter, active for much of his career (1625-39) in Rome. There he was nicknamed "Il Bamboccio" (Little clumsy one) on account of his deformed body. He was one of the leaders of a fraternal organization set up by Netherlandish artists in Rome to protect their interests. 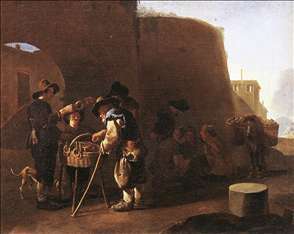 Van Laer was the first artist to specialize in scenes of street life in Rome. His work proved popular with collectors and he inspired numerous followers who were known as the "Bamboccianti". They were mainly other Northeners working in Rome. Their pictures are called "bambocciata", Italian for childishness. 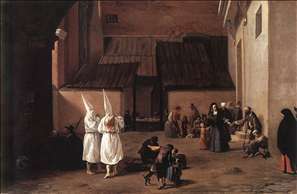 In 1639 van Laer returned to his native Haarlem. 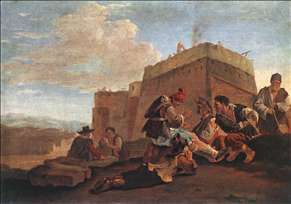 See more details about "The Cake Seller"
See more details about "The Flagellants"
See more details about "Landscape with Morra Players"